Thursday, the Baseball Writers’ Association of America announced Clayton Kershaw as the winner of National League Cy Young award. 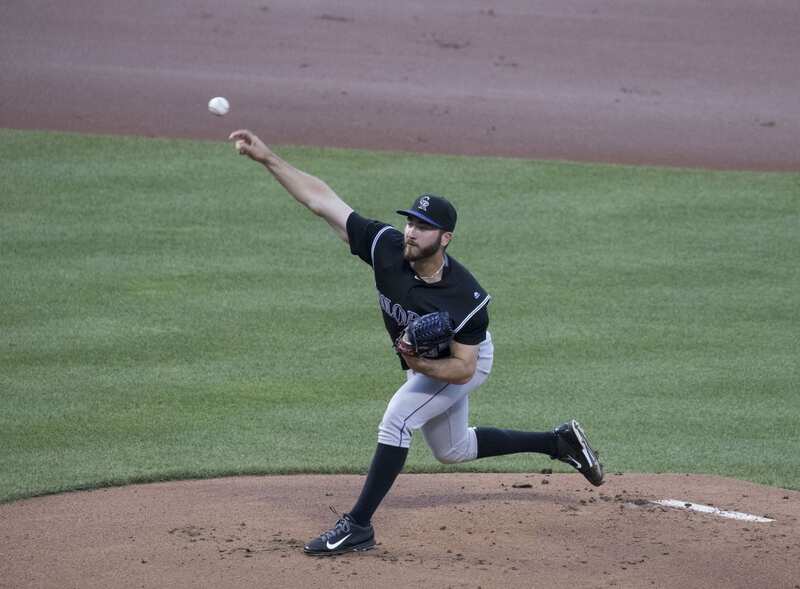 Kershaw was voted the league’s best pitcher, receiving 27 of the 32 first place votes with a total of 207 points. Roy Halladay finished second, followed by Cliff Lee, Ian Kennedy and Cole Hamels. Kershaw led the league in wins, ERA, and strikeouts (21-5, 2.28 ERA, 248 Strikeouts) and also won a gold glove earlier this month. 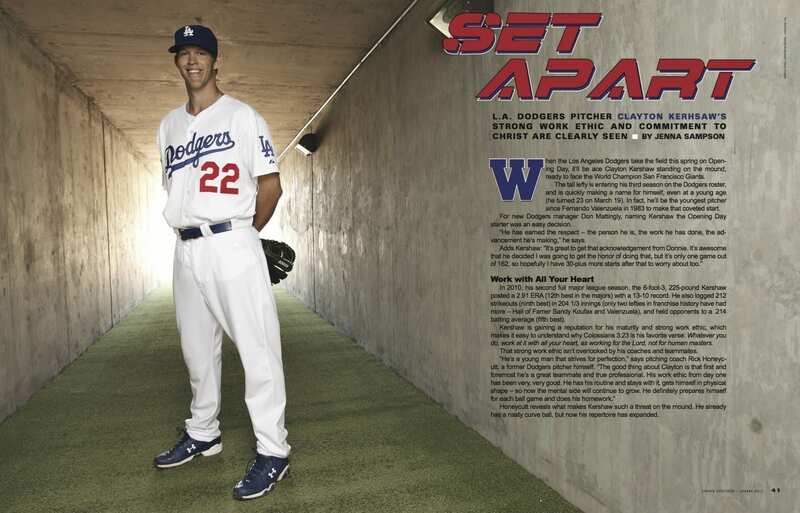 In the spring 2011 issue of Sports Spectrum, we featured Kershaw and he and his wife, Ellen talked about their mission trip to Africa over the offseason. 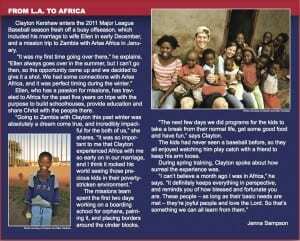 Clayton Kershaw enters the 2011 Major League Baseball season fresh off a busy offseason, which included his marriage to wife Ellen in early December, and a mission trip to Zambia with Arise Africa in January. Ellen, who has a passion for missions, has traveled to Africa for the past five years on trips with the purpose to build schoolhouses, provide education and share Christ with the people there. The missions team spent the first two days working on a boarding school for orphans, painting it, and placing borders around the cinder blocks. “The next few days we did programs for the kids to take a break from their normal life, get some good food and have fun,” says Clayton. The kids had never seen a baseball before, so they all enjoyed watching him play catch with a friend to keep his arm loose. 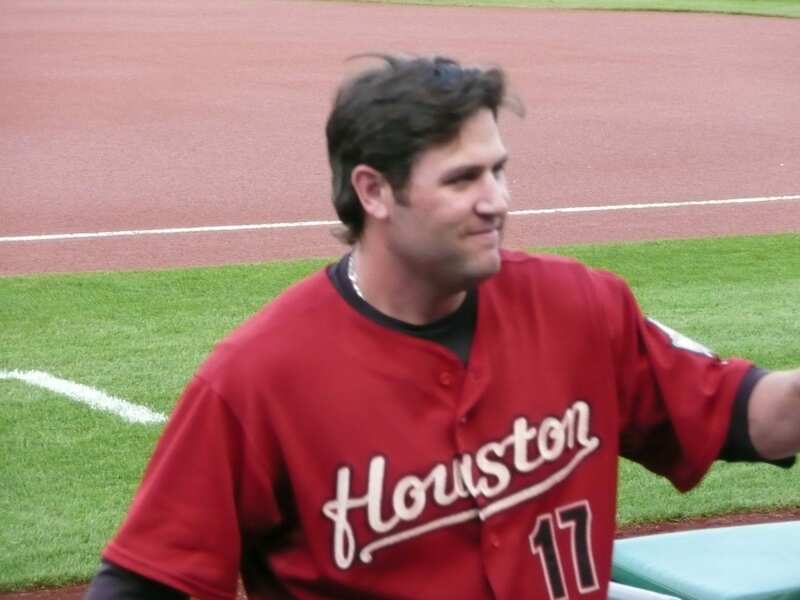 During spring training, Clayton spoke about how surreal the experience was.